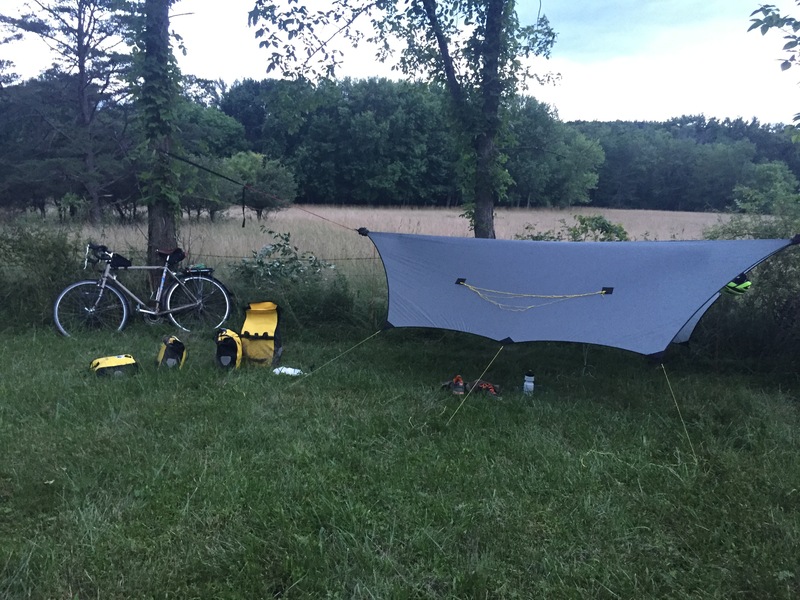 I want to share a report of my June 2015 trip on the C&O Canal path and the Great Alleghany Passage bike trail. Together they make for the longest stretch of car-free trail in the nation and tons of people ride the path, or parts of it, every year. I took me about a year of reading, dreaming, and planning to get everything together for a trip that ended up being close to 400 miles (all told) of riding and took 6 days. My goal here is try to answer some of the questions that I was unable to resolve in my web research before my own trip. 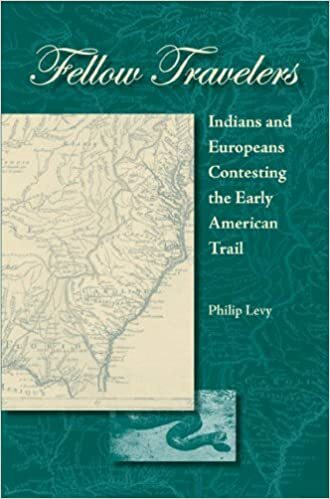 So, I am not really going to share any info about the beauty, history, or experience of the trail—that has been covered well elsewhere. I am also assuming that you dear readers have already done some of the basic research for your trip, so I am not going to offer much of a sales pitch for the trails or bicycle touring in general. Instead, I want to focus on the sort of questions I had before I left but for which I could not really find answers, and to share useful information I learned along the way that I had not seen posted elsewhere. I hope what follows helps, and please use comments to ask any arising questions and I will try to answer them. My Surly LHT in happy times before the mud set in. The first thing to cover is gear and condition. I am a daily rider doing about 10 to 15 miles a day with longer rides of up to 40 miles interspersed throughout the week. So any sense of what was physically hard or easy comes from that base vantage point. The bike was my 2009 Surly 29 inch wheeled, rim brake Long Haul Trucker (LHT) which I use for daily commuting (my Cannondale does the faster stuff). The LHT is more or less stock with two major changes. One was replacing the crankset with a Campignolo Veloce 52/42/30 so I could use the bike for more speed when not loaded up. The other is my fully broken in honey-colored Brooks B17. Bottoms vary, but to me, you are nuts if you try to do distances with anything other than a Brooks or a Selle Anatomica. I had troubles on the path, but not a single one of them were in anyway posterior-related. This is the angle of the Axiom Lowrider front pannier rack on the standard LHT front fork. The rest of the gear were things like my regular bike lights and all. Nothing really worth noting. The Topeak rack is great and the Ortiebs hung on the sides with no issues. They bounced a bit on the bumps, but nothing that was worth worrying about. I was a bit less thrilled with the Axiom front racks. The main issue was that they were not level to the ground. 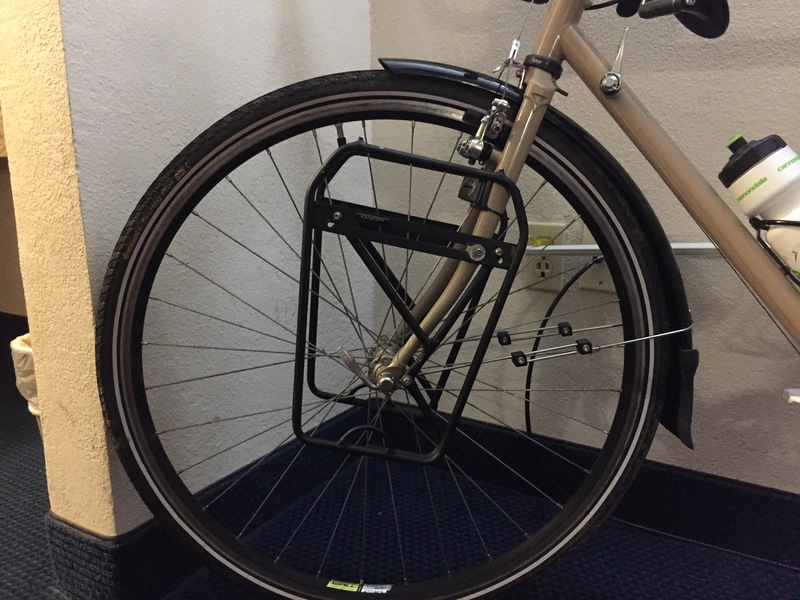 I mounted them on to the in-built Surly brazes (after a brief attempt at the provided U bracket harnesses) but no matter how I pushed and pulled, they had to sit so that the rearward edge was lower than the forward edge. 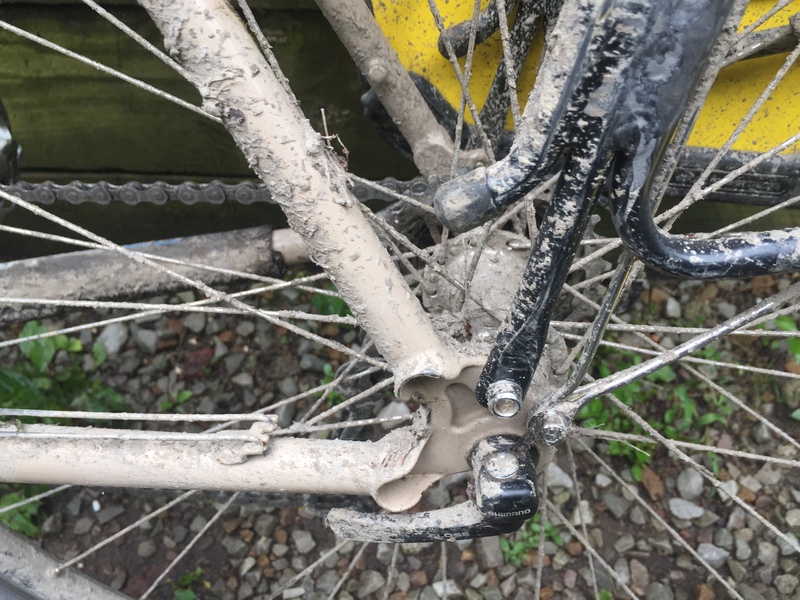 It is just an issue of mismatched fittings and makes for a poor match between bike and rack. Some people might not care about this issue, but it bugged me. It just looked off to me (you can tell from the pics whether than would gnaw at you or not) More importantly though, it meant that on the bumpy parts of the trail the panniers wanted to bounce loose, and gravity meant that they wanted to jump over the posts that Axiom placed on the top to hold the pannier in place. No matter what I did they slipped around a lot. 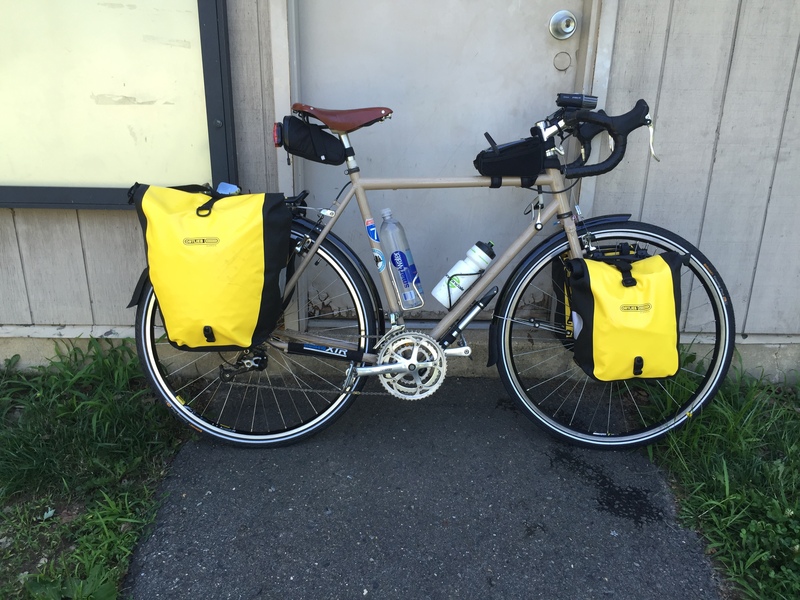 It was not a huge issue—I never lost a pannier for example–but it did get to me after a while. And since so much of riding entails staring down at the front end of the bike, I was a bit obsessive about where my panniers were sitting and even reached down a few times to shove them back into place. The movement was never more than an inch, but there it is. I will probably try another make for the next big trip. Apart from that, the racks did their job very well and were problem free. I was happy with my box and bag, but next time I am planning on putting a larger seat bag on board. I found that I would have benefited more and opened my panniers a bit less with a larger seat post bag. 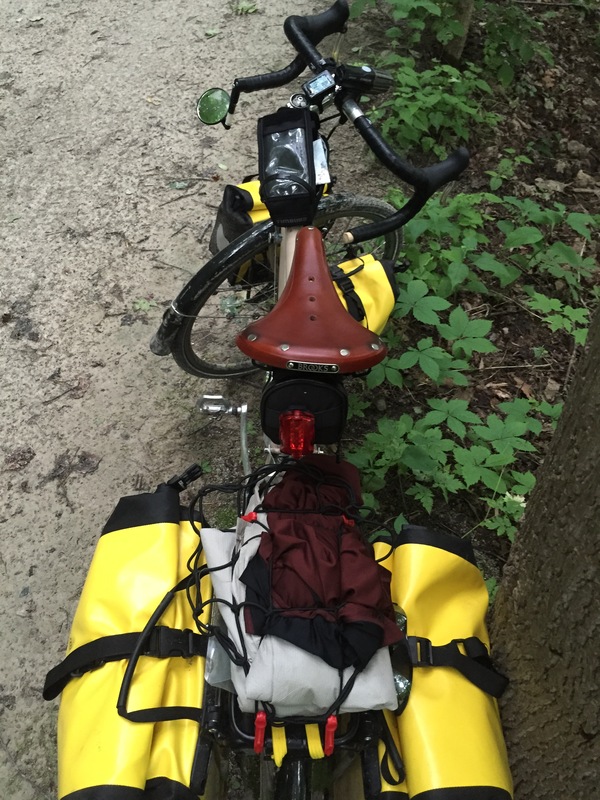 I have never warmed to handlebar bags, but I can see why people like them—map access especially. I am sensitive to gear hype, so let me be really clear about this. 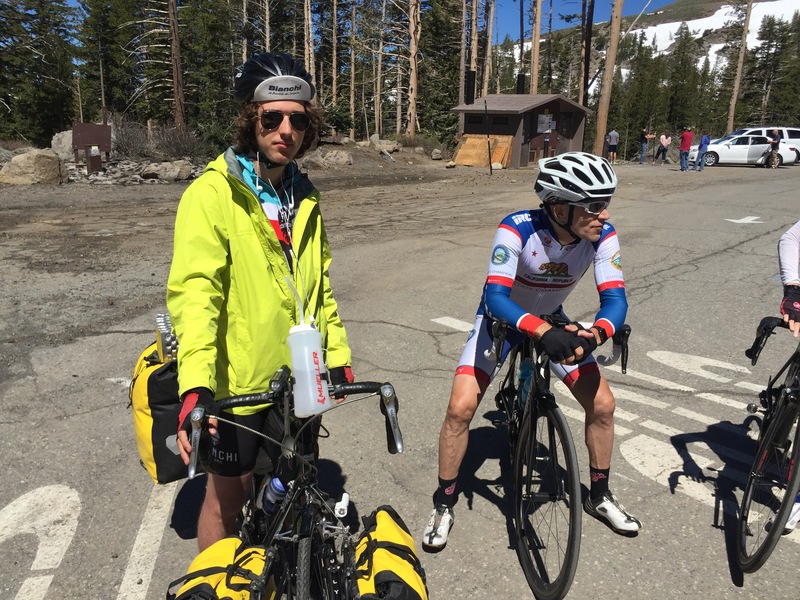 What is said about Ortlieb panniers and Brooks saddles is 100% true–none of it is hype. It was a wet trip and the Ortliebs were everything I could have wanted them to be. Easy to use, easy on and off, and bone dry no matter how wet and muddy they got on the outside. Other brands are also great, but I am glad I went with the Ortliebs and never gave a worry to my gear in them. Surlys also are everything everyone says about them. I love my LHT and it does not disappoint. It is a tank, plain and simple. 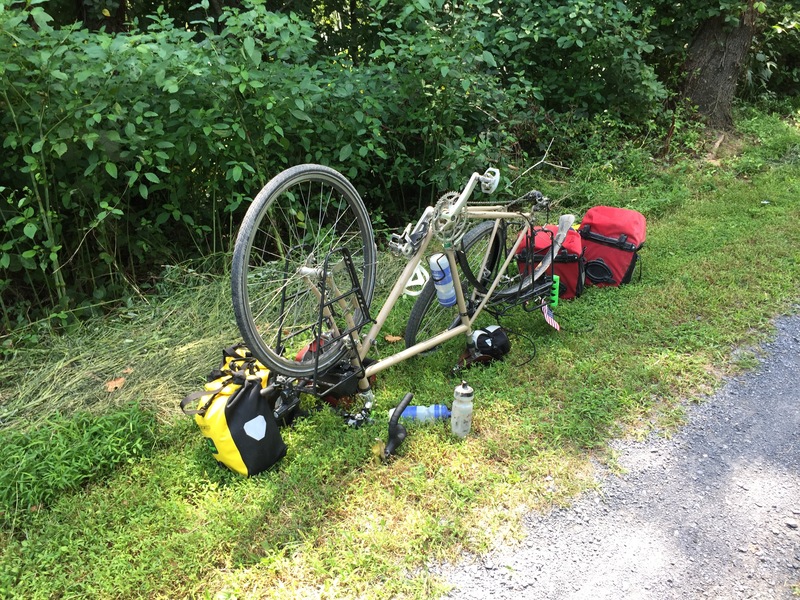 My load was not that heavy, but the bike never flinched, and more over, when I was coming down the hill in Harpers Ferry at 35 mph, the bike felt as calm and steady as it ever does—no wobble or shimmy at all to suggest the load it carried. These are amazing bikes and I loved having it as a partner. I am looking forward to trying out a Cross Check on this same path later in the year, but the LHT is indeed just what it is known for. I saw lots of bikes and curious configurations—from brakeless fixies to heavily shocked leisure bikes. Each one worked, but had a weakness. No one could say that about an LHT—it was made for this and was a dream to ride. I rode the Continentals for the weight and the price—about 20 bucks less per tire than Schwalbes. I wore out this type of tire once commuting and was disappointed whereas a Schwalbe would not have worn out in the same time and under the same conditions. But the Schwalbes are heavier and even though I am assured they live up to the reputation, I was not compelled to buy in. In the end, that was a wise call. The reason why is that when all was said and done, I regretted going with the 37mms. That is the most recommended tire size on forums and discussions boards, so I went with it. What I found though was that in the mud (of which there was much) 37mm was not wide enough to make a real difference—I skidded where I skidded and it was more skill and luck than equipment that kept me upright. This is the crazy mud puddle south of the Pawpaw Tunnel. Make sure to walk through this stuff. But on the dry and hardpack paths, 37mm was big enough for me to feel that is was holding my speed back. I am used to 23mm for long rides and 25mm for street commuting (both smooth surface tires) so I am happiest on a thinner tire. While the 37mms looked less like mountain bike tires than I thought they would when mounted, they were not really a huge help when things were slippery. My next trip in this trail will feature 32mms which I think will be a better splitting of the difference since the two trails (C&O and GAP) present really different dynamics. I suppose one could change tires along the way in Cumberland, but…yeah. If someone really want to do that, I would suggest using proper cyclocross tires for the C&O and something smoother for the GAP. The riders that are doing the whole C&O all in one day are on good cyclocross bikes and it makes sense. Had I sprung for the comparable Schwalbes I might feel a bit more bothered—or someone would be getting a good deal on ebay. The obligatory gear photo. I used a very light sleeping bag on the lower right. I was very glad I brought my Darn Tough short socks on the lower left. One of my camps. That is a Warbonnet Blackbird hammock under a Mac Cat tarp with Hennesy snake skins. The hammock is hanging on whoopee slings and tree straps. The guides are all shock cord or Zingit line. I will skip over sharing too much detail about camping and camping gear. I have been hiking for ever and do long hikes every year. My pack is pretty light and all the gear well-used and tested. 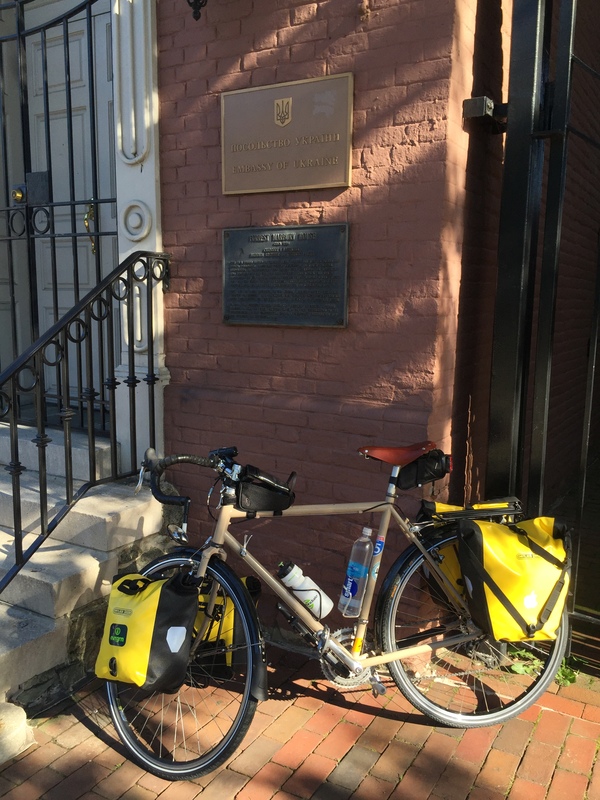 All I did was took the same kit I would take on the Appalachian Trail and put it in panniers—with some bike clothes, gear, and tools. I like camping and liked the campsites I stayed at, but it is worth nothing that it is really easy to stay in a hostel, hotel, or B&B every night of the trip if camping was not your thing or you wanted to travel light. Indeed, even though I was fully self-supported, I still found the lure of hotels sitting so close to the path too hard to ignore on a few nights. They really are everywhere and usually costing only between $50 and $75 (less for the hostels like the Teahorse in Harpers Ferry). I waited out one day-long rainstorm in one hotel and was very glad of it. As another trip review said, credit cards are lighter than camping gear. 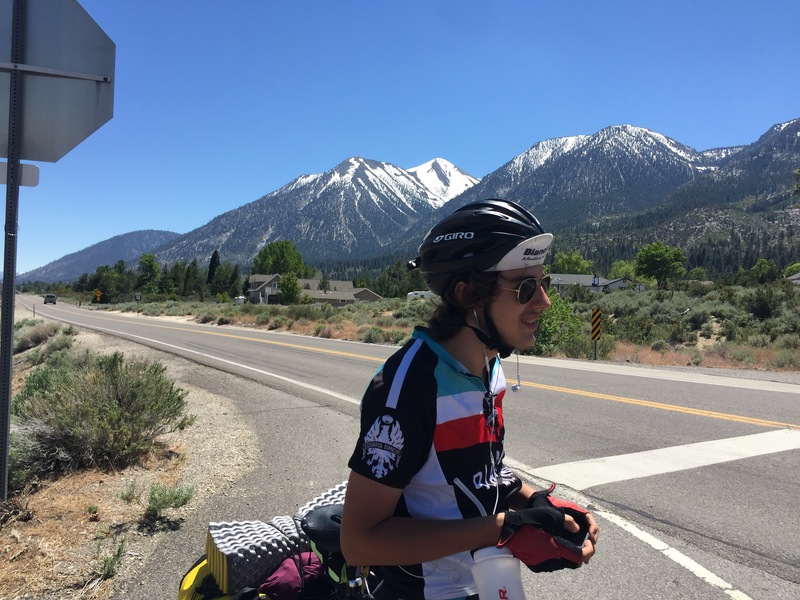 I am pretty confident that a rider could do this same trip with only a good bike, a water bottle, a few Hammer gels, a phone, and a wallet, and have a great time while eating and sleeping well all along the way. Also, there are tour companies out there that have organized trips for people, meeting them along the way at road crossings and parks and there providing them will full meals, any repairs needed, and even lifts to local attractions. I saw a few of these groups, and even though this is not my style, they did seem to be very happy campers. Their bikes were light and they wanted for nothing along the way. If you had the money to spare and did not feel great about self-support or winging it, this could be a great option. Or, just email me and I will just carry your crap in my half-empty panniers! C&O (right) and GAP (left) Profile Map. For logistical reasons I chose to do the trip south to north (S2N). To date, Amtrak has been slow in figuring out that most railroad coaches are larger than bicycles and therefore can fit a few on board. Word is that that lesson may have been learned and that bike-friendly service is coming, but even so, the logistics of which trains can take bikes, which ones cannot, which ones want them in boxes, and so on are daunting—not to say maddening for their short sighted foolishness (that’s what happens when you put funding and overseeing a rail service in the hands of people whose real interest is helping cars and gas producers). 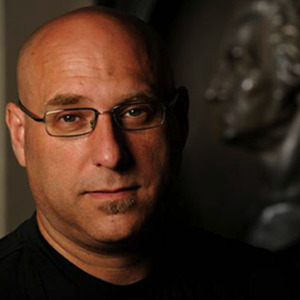 Thus, for me, it was easier to start in the DC area and meet up with family in Pittsburgh. That turned out to be a very smart call and the others I met going the same way all arrived at the same sorts of conclusions as I had. In fact, there is a pretty healthy minority who prefer the S2N path—and I am in that camp. My pre-trip research showed me although that N2S (Pittsburgh to DC) is the more commonly taken path. I am pretty sure that the uphill path of the GAP between Cumberland, Maryland and the Continental Divide tunnel near Meyersdale, Pa is pretty big part of reason people prefer to go southbound. The standard profile map makes the incline look pretty daunting—even though your better angels are reminding you that this is rail line and therefore pretty level. It is certainly true that going southward gives you more miles that are technically heading downhill. But consider this. The C&O going S2N gains just under 500 feet in elevation over 185 miles. That makes for a grade so level that you really cannot feel if you are either going up hill or down. Most of the C&O elevation changes happen at the lock sites (no real surprise, right?) and they are very short. Also, about a third of the locks (and all the aqueducts) are made so that riders go though the dry canal bed—meaning that your passage begins with a drop and ends with an incline no matter which direction you are headed. All of this means that the C&O is, in a word, flat—in places, very flat. There may be a psychological benefit to knowing that you are going downhill if you ride southward, but there is no real physical benefit. The GAP just south of Connellsville, Pa.
On the other hand, the elevation changes on the GAP are indeed noticeable. Again, keep in mind that the whole GAP is railroad grade. Even though a car can scoot up a 9% or 10% grade, a big ol’ freight or coal train would be slipping its steel wheels pretty badly even at a 3% grade. The Pittsburgh side of the Continental Divide is about a 1.3% grade and the Divide to Cumberland side is closer to 2%. The B&O railroad back in the last days of steam. Engines like this were made specifically to haul cars up grades. Both are steep enough to be felt in the legs (but I do most of my riding on a vast flat sandy pancake and consider myself a certified hill wimp). So, (and I suspect you can see where I am headed here) I would rather do 20 miles uphill on the slightly steeper grade and be rewarded with 125 of 1.3% downhill miles than do it the other way. Going up from Cumberland I had no real trouble maintaining about 8 or 9 mph fully loaded with a break now and then. That means that the hardest part of the trip took less that 3.5 hours (breaks included) and all the rest was either flat or a noticeable downhill and in my favor. There also was a psychological benefit. 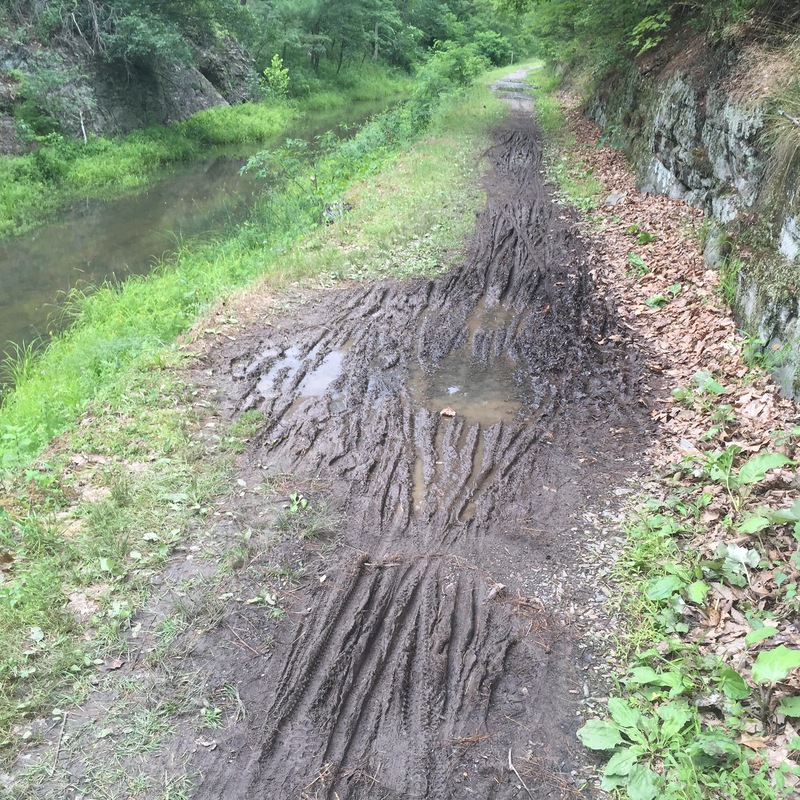 The trail conditions of the C&O are considerably poorer than those on the GAP—the former being early nineteenth-century mounded clay and earth with some gravel here and there, and the later being more recently-made packed limestone gravel atop water-draining stone. The C&O was a far harder ride than the GAP and I knew it would be. So, it helped to know that all the hard work up front would eventually be rewarded with a nice 125 mile ride at the far end. Indeed, once I crested the divide and got up to speeds of 17mph and above, I was very happy—not to say self-satisfied. One counter argument to my S2N thinking though is that once passing Boston, Pa. going S2N, the GAP really changes. Outside of town it has its only stretch where it shares the space with cars—about a half a mile of very poorly marked path that leads to a challenging bridge over the Youghiogheny River (which has the GAP has been following for some time), and then on to the both confusing and powerfully unscenic path through and out of McKeesport, Pa (some nice steep bridge ramps along the way, but even I overtook casual unloaded riders on them). From there it feeds onto urban bike paths or city streets all the way to the fountain at Point State Park in Pittsburgh. The paths are paved and fun, but, after a few days peddling alone in the woods, suddenly being dumped out amid cars, commuters, and the sights and sounds of the city was a bit disorienting. I can see how some riders may want to put all of that behind them as soon as possible. For me, it was fine, and it made for a dramatic end to a long quiet ride. 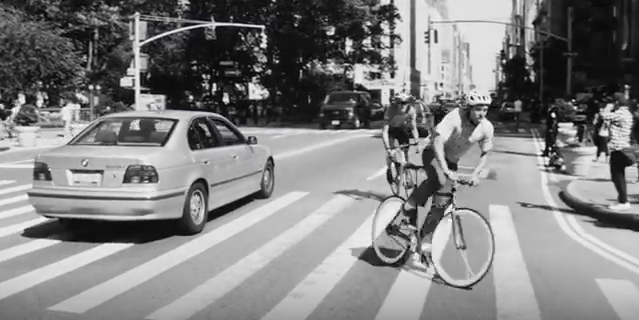 The last mile or so on Pittsburgh streets in rush hour traffic was quite dramatic—a bit a slowed down Lucas Brunelle film. My bike tried to visit Ukraine. then down the steps by foot and off on the muddy C&O. 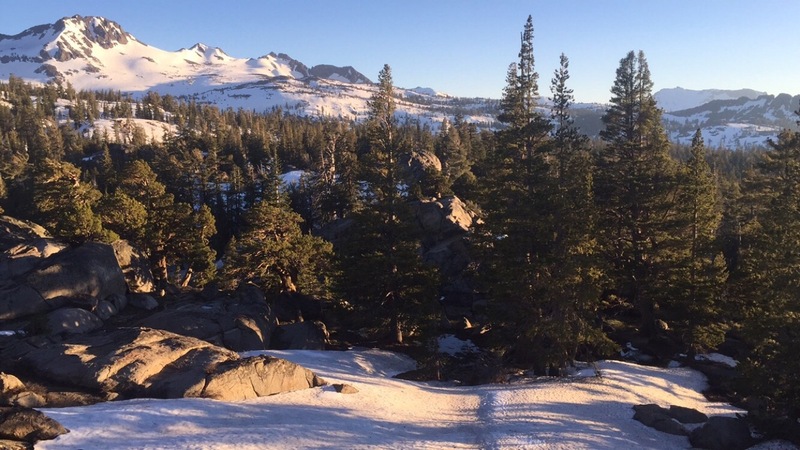 Once I was on the trails—both trails—I never was lost in the slightest way. The only confusion was at the city ends. I think you would have to work hard to get lost on these paths. One place that was a bit confusing—and that even was just a tiny bit—was just north of the Big Slackwater Causeway near MacMahon’s Mill. Some background (despite the fact that I said I wouldn’t do history herein). 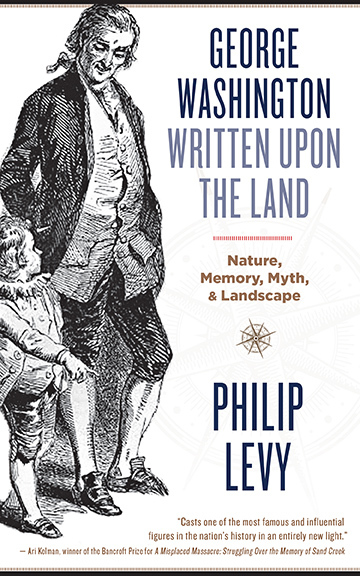 When in use, the canal depended on water let in from the Potomac. In a few places you will cross the locks designed to let water in from the river. One stretch of the path though had the boats leave the canal proper and just ride along on a specially dammed section of the Potomac itself. Floods have long since knocked out the narrow towpath that ran along the river, but wise use of Federal funds have replaced those frail paths with more durable concrete causeways. These are a fun treat too after dozens of miles of mud pits. But, they end, and the path in a few places gets a bit funky. I may have been tired or a road zoned, but at one point I rode back to a clear spot to just make sure I had not missed a turn. I had not, the path was just chewed up a bit. That was the closest I came to getting lost on the paths. Rain. It rained a lot. A lot. Just my luck. I took a day off in Williamsport Maryland partly to hide from a day of downpours. Some people like rain, other do not (I am in the later category). But like it or hate it, rain does some simple empirical things to the ground. On the C&O it made for many many puddles. Closer to DC the path is a dirt and gravel track, but as you get deeper into Maryland, large sections of it become a double track with a grass strip down the middle. These areas in particular seem very susceptible to puddling and pot holes. As always the best thing to do is just hold on and ride right through—trying to swerve to avoid will only lead to trouble. The catch of course is that under that brown water surface may or may not be a big pothole waiting for you. My tires were pumped high—90 psi generally. 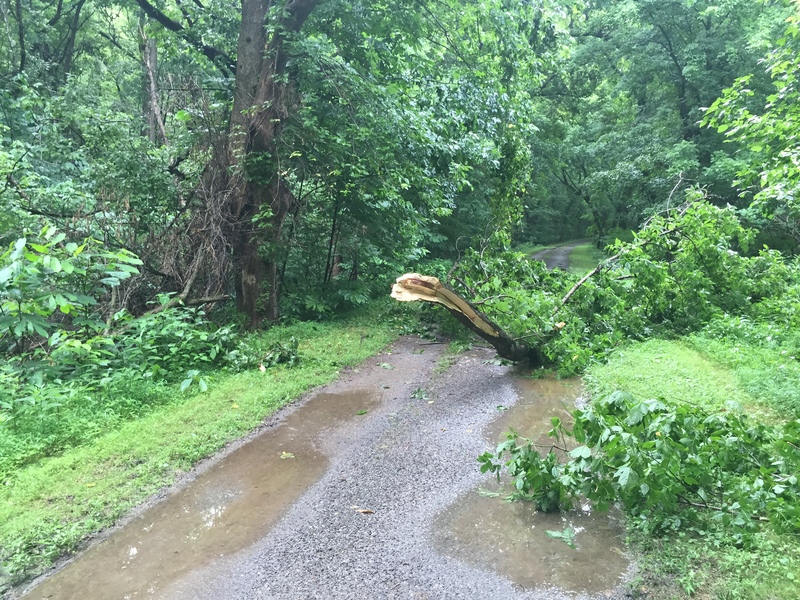 There were a few downed trees. This one and I particularly did not get along well. Note the puddles though: that is what most of the C&O looked like after rain. That made a harder ride, yes, but it eliminated the worry about pinch flats as I went in and out of thumping puddles. The storms downed trees and my only real mishap came in try to ride past one and getting bogged down in the muddy grass on the border. There were a few downed trees. This one and I particularly did not get along well. The resulting scrapes from the resulting fall were pretty minor, and since no one was there to see it, it never happened….right? In some places the mud puddles were pretty heavily rutted to the point of trouble. 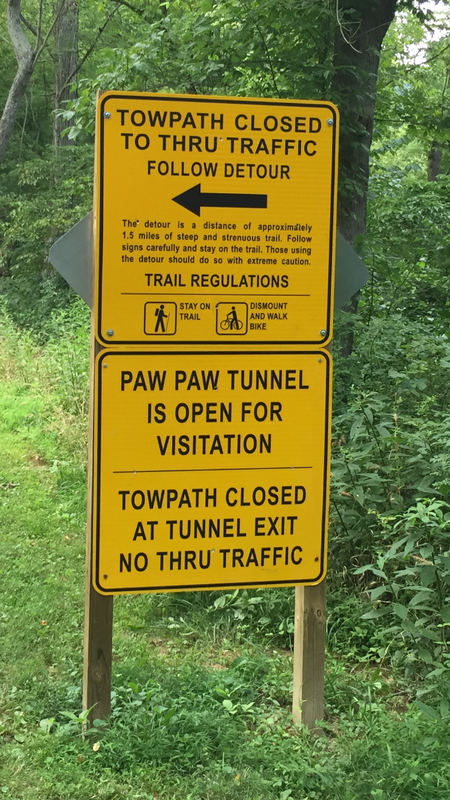 The south side of the Pawpaw Tunnel for example is one hairy spot. The path is a bit narrower there and with a sheer wall on one side and an 8 foot drop into the canal on the other, it pays to walk through ruts. Much of the path was so flooded even before a big rain that I felt it best to just sit out what promised to be a big ugly day. I know others went ahead, but I have no idea how happy they were about that choice. Just outside of the town of Big Pool, MD is the 20-some-odd miles of the Western Maryland Rail Trail—a paved former rail line that hugs the course of the C&O very closely. Trail wetness made it too tempting to pass up, and so I had a nice ride with paving under my tires for a short while. Rain on the GAP was just as wet, but it did far less damage to the path itself. Rain will dramatically slow you down on the C&O and make the ride harder: on the GAP it was cold and wet, but had little effect on the ride. One of the working water pumps. Look for water at the base to set your expectations before pumping. And speaking of water let me say a bit about supplies of it along the way. The C&O is dotted with campsites—the NPS map shows them all. These are usually equipped with a hand pumped well that produced drinkable, if a little bit iodine flavored water. The catch of course is that not every pump works and there so far no regime for marking the ones that are not operational. The whole trail is owned and maintained by the NPS and they do an excellent job. 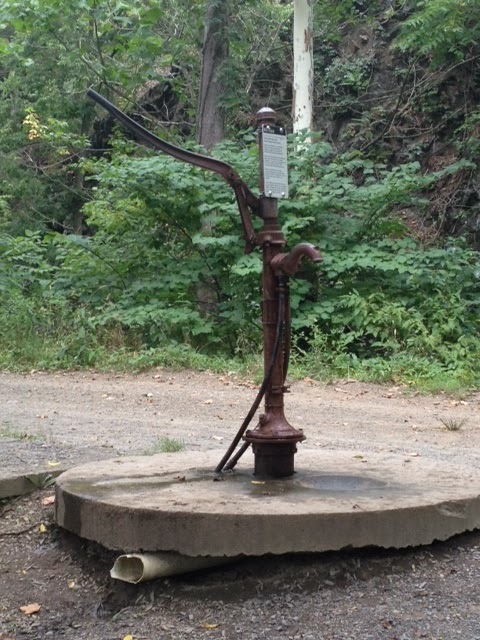 But, the NPS is woefully underfunded and one result is sluggish maintenance on things like Maryland campsite pumps. The fun of course is figuring out if this pump or that one would work! I only found three that were useless. Sadly for me, one was at Pigman’s Ferry where I spent a night. I had sort of counted on that water for the morning (but ignored the pump until then), so instead I had to refill at Spring Gap a few miles along. But therein lies the point—it was very easy to get drinking water on the C&O. My camp at Pigman’s Ferry. The GAP was somewhat different. First off, the trail lacks the regular campgrounds like on the C&O. There were small cleared areas at intervals (benches too, many of which bear the names of people to whom they are dedicated). There are also a few covered picnic tables, often near road crossings. But there were not really campgrounds. Mostly the camping sites were in the form of small sidings popping up here and there. 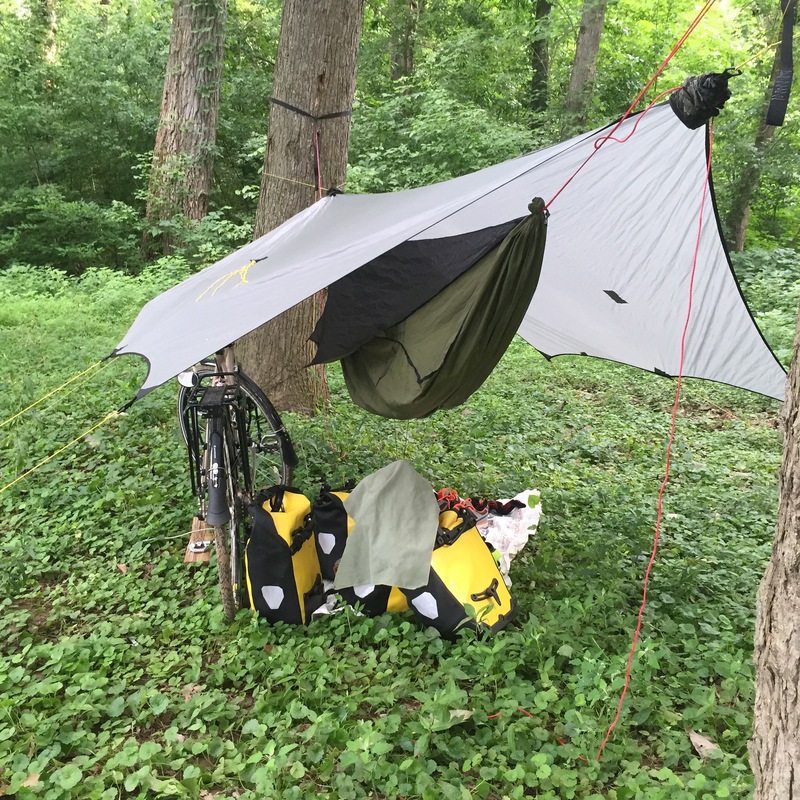 I am a hammock camper, and while there were good trees at most (but not all) of the Maryland campsites, the GAP siding campsites were less than ideal for hammocks. The GAP also lacked the regularity of water supplies. There were streams and falls all over—particularly on the more northerly side. I use Aquamira (a bleach additive) to sanitize my water in the woods since it is very light and that was fine. It also was a rainy week and all streams and falls were quite lively. Some of the trailside towns have provided water supplies right on the path. The ones I recall most clearly are (links below) Meyersdale, Ohiopyle, Connellsville, and West Newton. Frostburg Maryland, has a nice little trail side rest area—but sadly no water as of yet. There also are some formal free campgrounds with shelters and water, but there are mostly north of Connellsville. Recently that town has doubled the number of shelters they graciously provide right next to the path. There are essentially AT-style raised leantos and are wonderful. The pump is north of lean-tos. All told though, between public water supplies, streams, and the occasional store close to the trail, it was easy enough to find water even though it came in a less uniform way than on the C&O. Speaking of towns, they seem to have two different kinds of relationships with the trails and its many cyclists. One is the “pretend none of this is happening” reaction. The town of Boston, Pa is one of these. There are two or three very nice old homes converted into restaurants and pubs right along the trail on the north end. These cater to cyclists and are worth the visit. But if you make the mistake to turn into town itself as I did, the best you will find is some orange juice in a gas station. Other towns like Deal or Fort Hill are just communities with the trail running through—no supplies no lodging, no interest in being more. Other towns have adopted a completely different attitude and see in the trails and the many credit cards riding along them as antidotes the loss of industrial jobs. The Queen City of this renaissance is Ohiopyle, Pa. The trail runs right along it and that fact, plus a good whitewater site has made the town a seasonal outdoor haven. What my bike looked like most of the time. 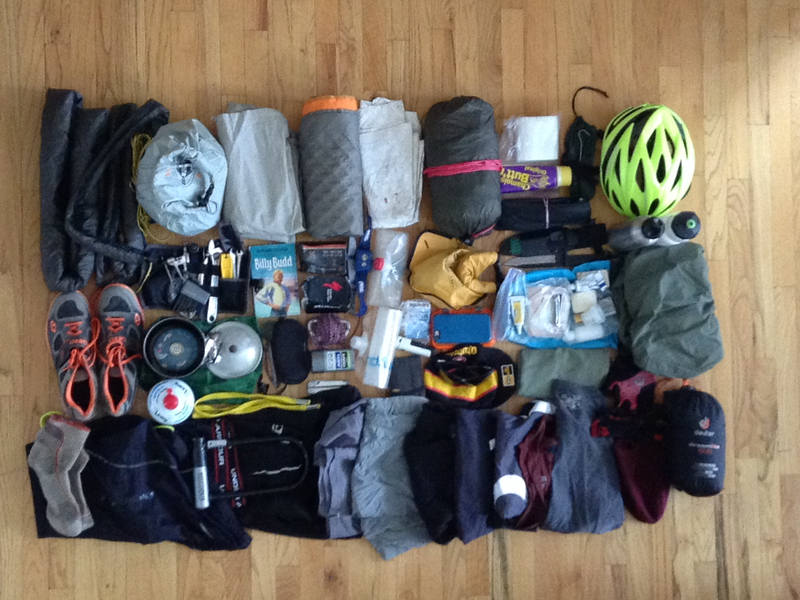 Food, lodging, supplies, bike shops and so on all focus on the path. Cumberland Maryland is in the process of reimagining itself as cyclist town and it was a worthwhile stop. Connellsville, Pa has bed and breakfasts about and of course has built a special free campsite. 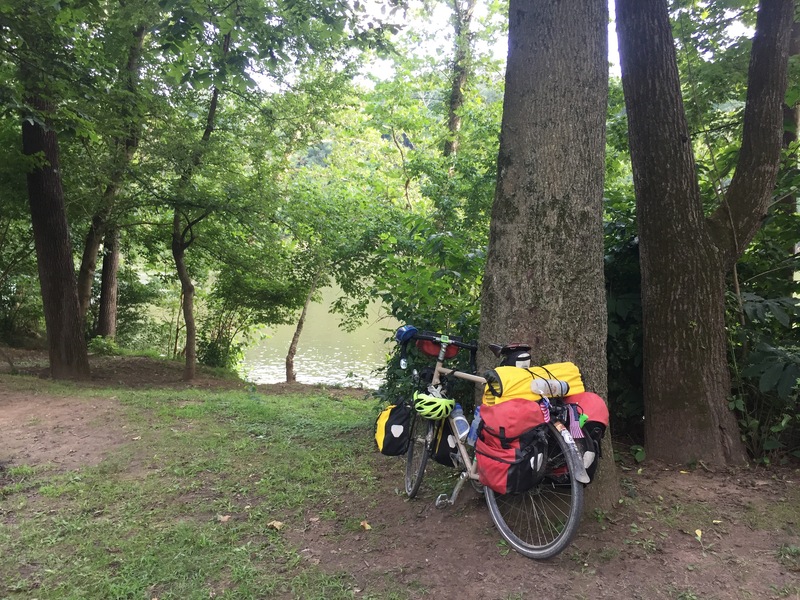 Meyersville, Pa also is turning its eyes towards the trail and has food, supplies, and lodging. West Newton, Pa has set up a welcome center housed in its old rail station. There is water there, info, souvenirs as well. Sadly no supplies, but that is because they do not want to compete with merchants in town. Those merchants are mostly over a bridge off the trail and I am not one for diversions except when really needed. So I did not see West Newton even though it is clearly working to make itself a trail town. I did pull off into Confluence, Pa for groceries and a stop at the bike shop there. Confluence also is remolding itself to be a trail town and the politics of this is visible in the fact that on at least one dead end street some grouch hung a sign saying “No Bicyclists.” That curmudgeon though is losing the battle as the folks in Confluence are friendly and helpful and the town has a lot to help people on the trail. 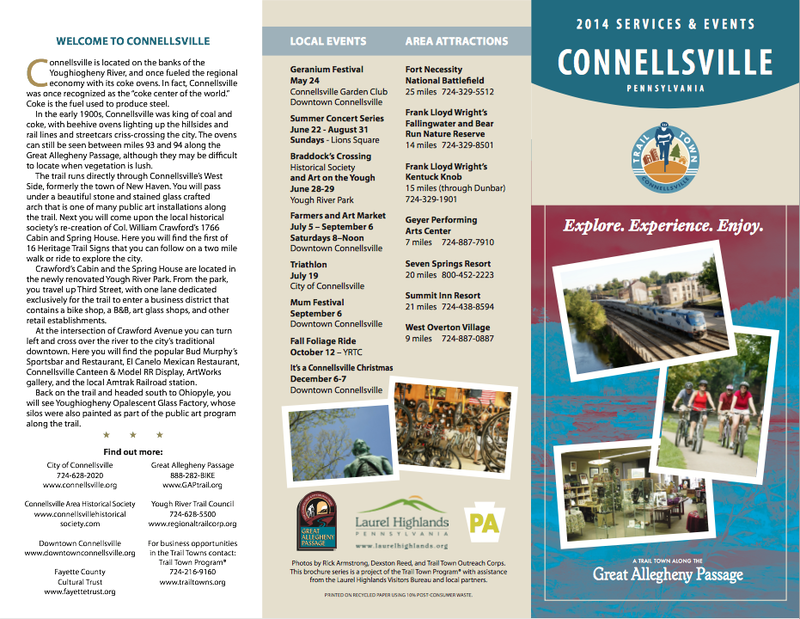 The Allegheny Trail Alliance and The Laurel Highlands Visitors’ Bureau have pulled together and printed up a uniform set of brochures featuring maps and info for the towns working hardest to make your GAP trip more pleasant. I found copies of these everywhere—from the Visitor Center in Cumberland Md, to the public notice boards near many road crossings. This what the brochures were like. They were everywhere and were really helpful. There were great and really helped plan things. I wish I had them before hand, so here are the links to the various town brochures in PDF form: Meyersdale; West Newton; Confluence; Ohiopyle; Rockwood; Connellsville. 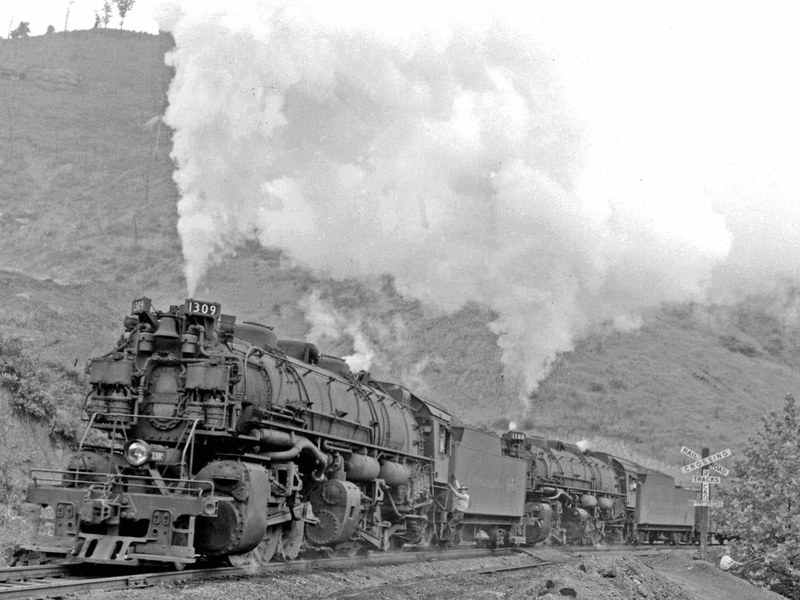 The C&O passes through fewer towns than the GAP. Brunswick Md is very close to the trail, but I suspect it gets passed over usually in favor of Harpers Ferry, WVa a few miles along. Getting to Harpers Ferry means crossing the rail bridge over the Potomac, and that means hauling your bike up a twisting set of stairs. But Harpers Ferry is an Appalachian Trail town and has the AT headquarters there. Food, supplies, lodging are all there and it is great town to visit. Williamsport, Hancock, and Cumberland Md. are all easier to reach and both have the expected amenities. 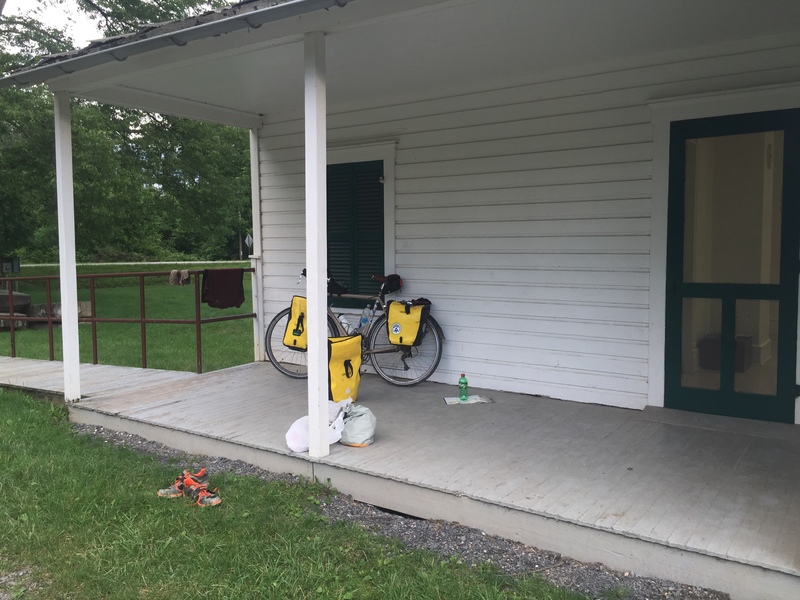 The celebrated C&O Bicycle shop is in Hancock and has its large bunkhouse out back for cyclist lodging. 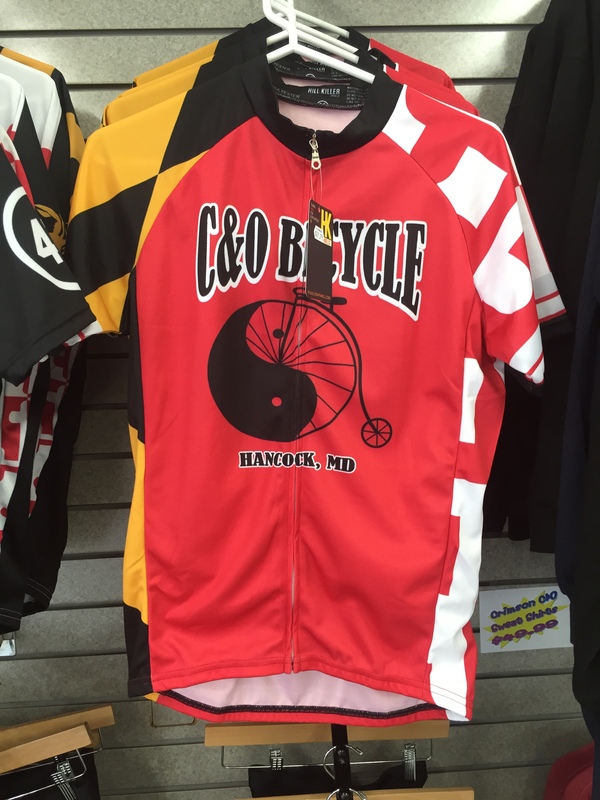 It is worth stopping at all the bike shops you can make since that is where you will meet other riders and get info and needed supplies. And repairs of course! I had chain troubles and got some help at the C&O Bicycle Shop and again at the CTC Bike Shop in Cumberland (thanks Wayne once again for the perfectly timed lift and the chat!). 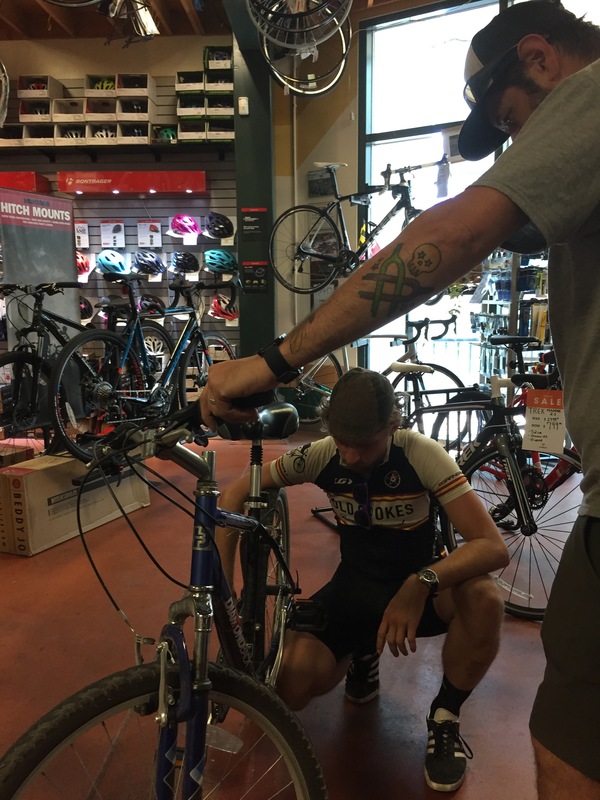 The bike shops are all ready to help and understand the fact that you are rushing along—so service is fast and efficient. I ran into two women heading south who had blown out a tire just outside of Confluence. We managed to get in a new inner tube and they set off to make it to the next road crossing and once there figure out how and where to get a new tire. By the time I reached the Confluence Cyclery a local trail angel had already arrived there having met the women at their road crossing. He was picking up a new tire to run back to the riders so they could get back on their way. When my chain popped on an uphill (the quick lock link gave out! ), I was lucky enough to find Wayne right there starting their own ride who graciously postponed it to load my bike on his rack and drive me into town to get a repair. The point is that there are plenty of wonderful and generous local folks who are happy to help riders out when trouble hits. The network is informal, but the pros at the shops all understand the drill and there are people all over who are on your side. Each year more and more people fall into this camp as the trails become more and more central to local economies. The lock house at Oldtown, Maryland. Charging my devices was not that difficult. Between hotels and towns with places to sit and have coffee, it was easy to recharge. There were outlets in the mens’ room (and presumably the womens’ as well) at the rest area at the Great Falls Tavern Visitor Center. There also is a very nice little museum set up (the only of its kind) on the lock house at Lock 71 near Oldtown. Lock 71 at Oldtown Md was a nice place to rest and tidy up while charging devices. As long as it is open there is a fine outlet in there. I sat and dried out a bit on the porch there while the devices recharged. There was nothing quite like this on the GAP, but there more towns as I said before. All in all, the lights and phone were never really low during the trip. For the most part the ride was fairly easy. My short days were due more to being lazy in town and my longest day—about 75 miles—was pretty easy. In the mud I had no trouble maintaining between 10 ad 12 mph and was faster where it was dry. 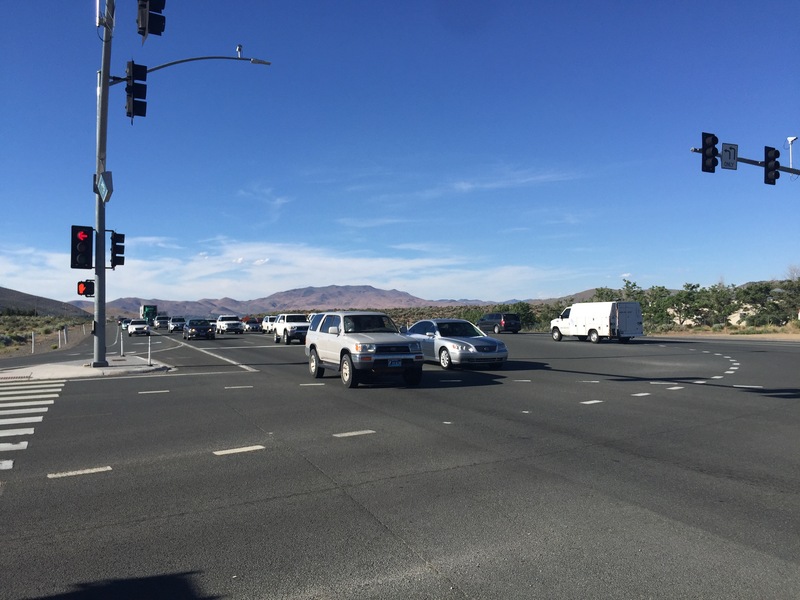 There is technically a speed limit of 15 mph on the GAP at least, but little enforcement. It was a good ride, but never really that strenuous and as I said before, there were all sorts of riders on all sorts of bikes. It is manageable and a great time. I hope that this helps you as you plan out your own C&O GAP trip and let me know if I can answer any questions.